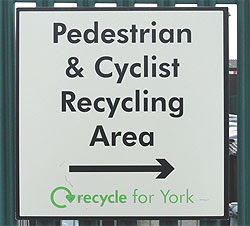 An intriguing sign in York's James St.
What happens to discarded pedestrians and worn-out cyclists? Do they get dismantled for parts and raw materials? Don't think my liver has much resale value, but the brain's hardly been used. Of course, it means 'recycling for', not 'recycling of'. 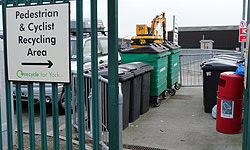 This being York, the main Recycling Facility has a special area for walking and bike access. Which is just as well. Science is welcome to my body, but I think the bike will fetch more on eBay.